“Leaving the greyish-white skies of Lima, I arrived in Jaen to the vivid colours of the Amazonas. My driver and I travelled to Cocachimba in the gathering dusk, and it was full dark by the time we arrived at Gocta Andes Lodge. 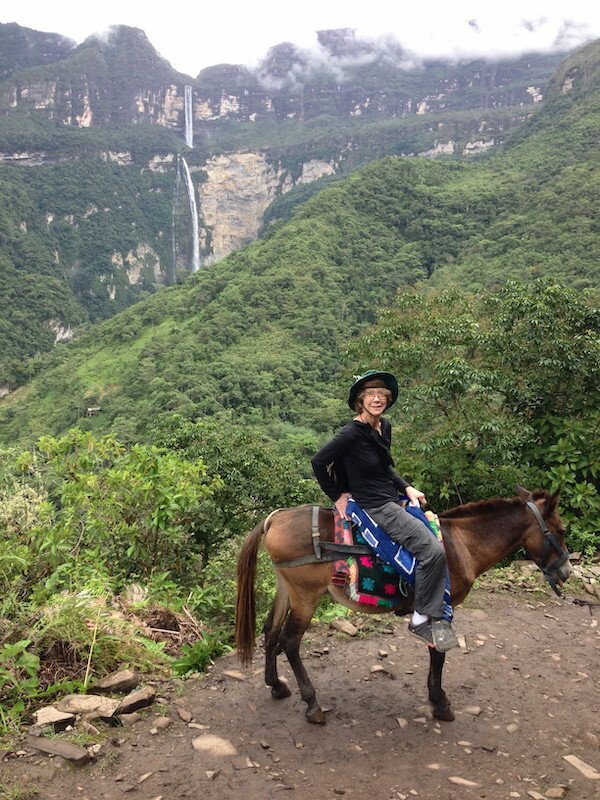 Elizabeth on horseback, with Gocta Waterfall in the background. I woke the next morning to a panoramic view of the Gocta Falls from the terrace of my room. We were perched on a hillside in the high Andes, with wonderful outlooks in every direction and the lodge positioned to take full advantage of them. The big draw of course is the huge waterfall hidden in the rainforest. Gocta is some 771 metres high and counted among the top 10 highest in the world. Being tall and narrow, they lack the imposing bulk of Niagara or Victoria Falls, but are very scenic nevertheless, and riding through the rain forest a unique experience. I had the services of an English-speaking guide and Claudia had suggested (wisely as it turned out) that we hire horses and ride in to the falls. It is about a 5 mile hike in, with a steep descent to the valley floor, and being the rainy season, very muddy (read, slippery!). Only the first 3 miles are navigable on horseback, so leaving the horses to a well-earned rest, Claudia and I hiked the remaining 2 miles to the foot of the falls. Claudia was a fund of knowledge about the local flora, and we saw many of the brightly-coloured hummingbirds the region is known for. Also on the itinerary for my stay was a day trip to the ruins at Kuelap. This was a hilltop fortress and is bigger in area than any other structure in Peru. It was continually inhabited from about CE500 up till CE1100. The complex had an outer wall protecting over 400 circular houses, thought to have been home to about 3500 people. 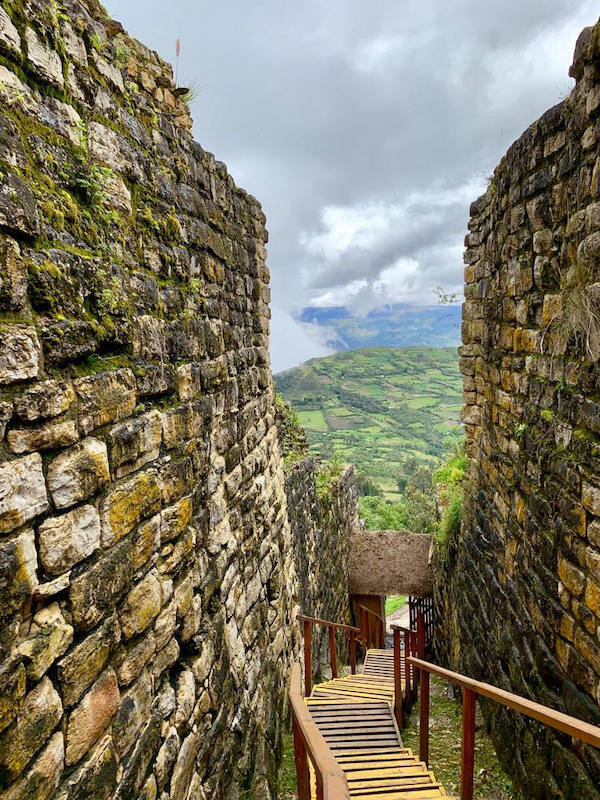 The Chachapoya people who lived there were known for their shamans, and as great sorcerers and herbalists. The Incas were unable to overpower them, and only 5 Inca buildings have been found among the hundreds of structures in the fortress. Claudia and I were saved from another long and steep trek by the installation of a gondola some two years ago, but similar to Gocta Falls, we had to climb the last several hundred metres to the site. I was particularly struck by the numerous and colourful Bromeliads, which seem to grow on every tree, and the spectacular vistas down to the valleys below us. I was reluctant to leave, but Pumarinri beckoned. The lodge is about an hour’s drive from Tarapoto on the upper Rio Huallaga. The whole area is flora and fauna-rich, and much to my delight that included owls (although I didn’t see any!). Another beautiful setting on the banks of the river, with 155 acres of private reserve…my bedroom opened on to a terrace right above the water. 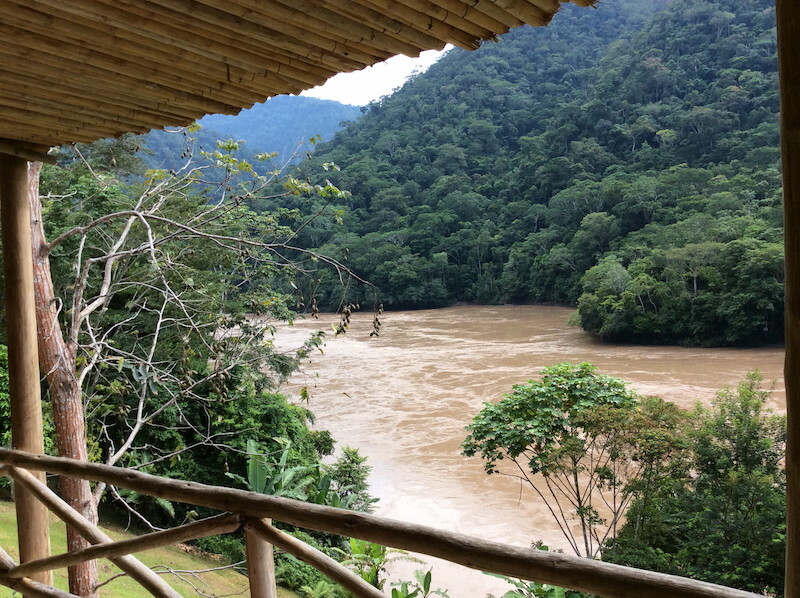 View of the Rio Huallaga from bedroom at Pumarinri Lodge. I shall never forget sitting there watching the cloud forest “breathe” out puffs of white mist, that coalesced into fluffy clouds and drifted away….quite magical! Once again one of the local excursions involved water, this time the Cataratas de Pucayaquillo; another steep and muddy hike in, but this time with the opportunity to swim in the pools below the waterfall. The water was cold, but with the ambient temperature at 35C, very refreshing. Pumarinri has its own Tilapia ponds, so I was able to eat some of the freshest fish I have had in Peru. I should have budgeted more time there, but the Amazon River was calling! And so to Iquitos…..how do I describe this frenetic, noisy city? The faded grandeur of its 19th century colonial architecture is a reminder of how the rubber boom changed it from a frontier town to a city. A lingering monument to that time is the Malecon Tarapaca, which stretches the length of the river frontage. To the south it runs into the outdoor Belen Market, which covers many blocks and is famous for the huge variety of jungle produce on sale, including bush meat. I saw caiman tails, armadillos, turtles and monkey meat for sale. It includes the Pasaje Paquito, an alley filled with stalls selling unique medicinal products ‘guaranteed’ to treat any and all ailments. Stall selling Amazonian delicacies in Belen Market. Behind the market is Belen village where thousands of people live in wooden houses which float when the river floods in the rainy season. I wanted to visit both places. In the course of a conversation with one of the guides at the local museum, I mentioned this and ‘George’ told me that the market was not safe for a foreign woman alone. So I hired him for the day, and he proved to be a lively and knowledgeable guide. He took me on a boat tour of the ‘Venice of the Amazon’ which enabled me to see so much more than I could otherwise have done. And then he took me home in one of the motorcycle rickshaws called motocarros, which are the primary means of transport around the city. Iquitos was the boarding place for my trip on the MV Zafiro, my floating home for the next 4 days. We would be travelling in the Reserva Nacional Pacaya-Samiria, which at 20,800 Sq.km. 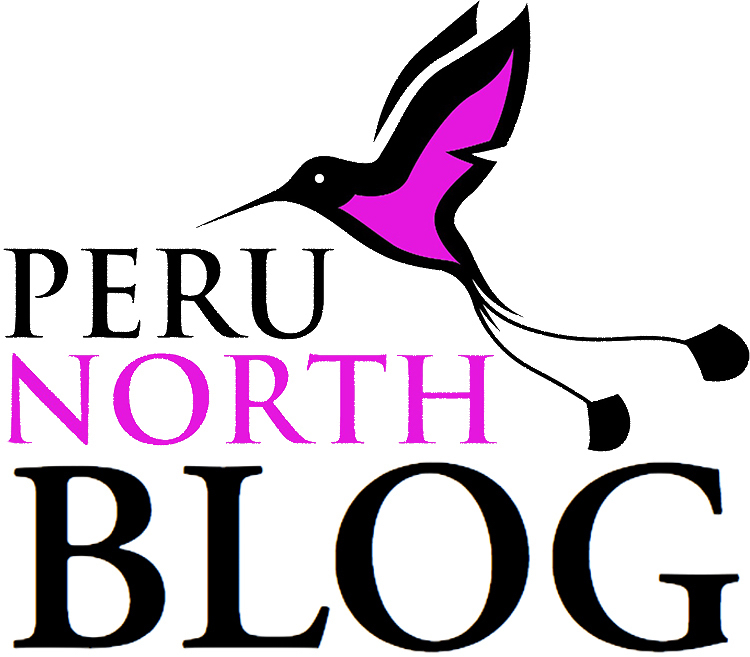 is Peru's largest reserve. Today some 42,000 people live in the reserve in 94 different communities, surviving on hunting, fishing and gathering… and growing bananas. They are called ribereños, or river-dwellers, and we were to meet some of them on our travels. 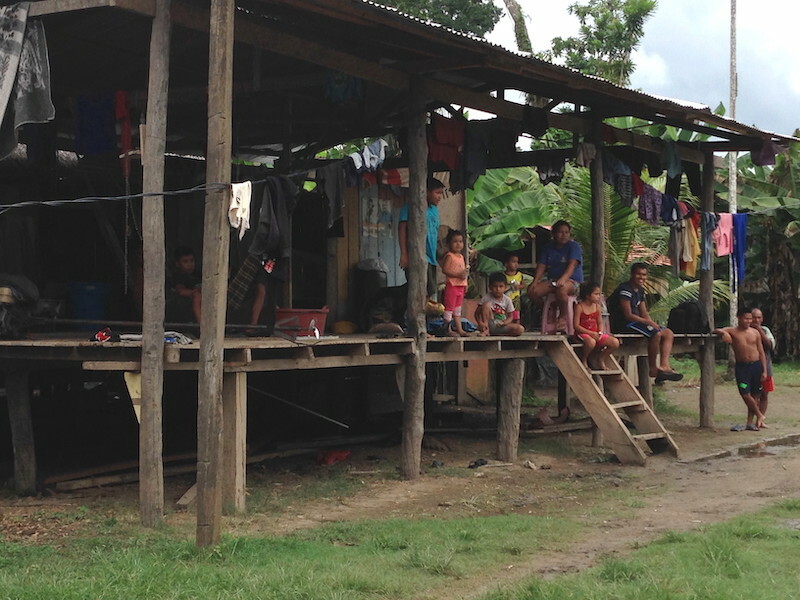 A family home in a village beside the Amazon River. My cabin on the Zafiro had a full wall of glass, so I had an uninterrupted view of the passing river scene. On board, our naturalist guides were a trove of information about the wildlife and vegetation, as well as the geographical and historical background of the area we were traversing. Pre-breakfast excursions in the expedition boats showed us the river awakening and evening forays yielded tarantulas, snakes and back caimans in a jungle full of nocturnal sounds. On other day trips we saw troupes of woolly monkeys with their prehensile tails, as well as Capuchins and a single pygmy marmoset. Pacaya-Samiria Reserve is known as ‘the Jungle of Mirrors’. We were very fortunate to see the famed pink dolphins and watched them for about 30 minutes as they fed on the whirlpools of fish caused by the river current. Two species of fresh-water dolphin live in the Amazon River – the smaller grey dolphins and the large pink ones. The pink colour is caused by a lack of pigment in the skin, so the underlying blood vessels show through giving a deep pink hue to the dolphin. We visited the Vista Alegre Community were we were taken on a tour of the butterfly farm to learn about butterflies and their importance to the jungle environment. 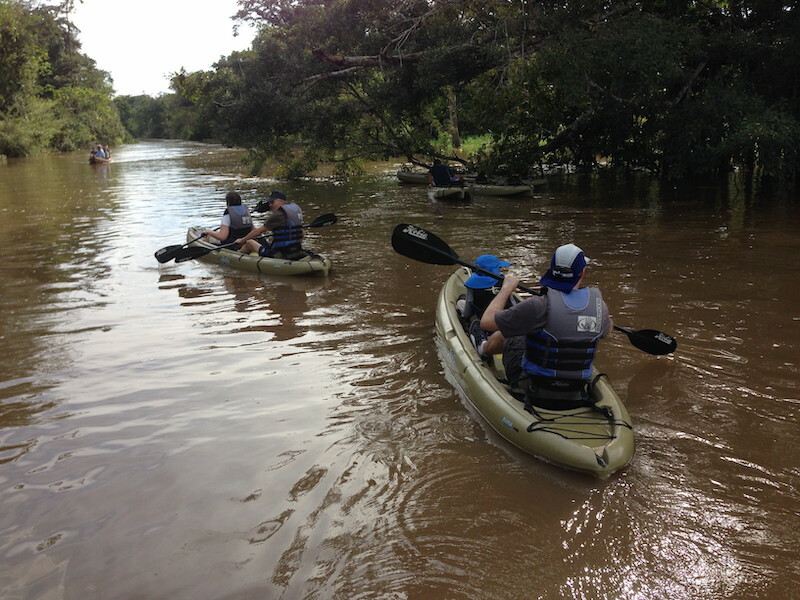 We took a side trip to the Yarapa River were we walked in the flooded jungle and looked for sloths and macaws – no sign of either, unfortunately. One of the highlights of the Zafiro experience was heading down to Parana Creek to catch Piranha (yes, we did) and watch our guide toss them out over the river to be caught gracefully in mid-flight by an Amazon hawk. Another highlight was an afternoon spent kayaking on a quiet tributary of the main river where we met some of the local residents traveling in their wooden dug-out canoes. Kayaking along a tributary of the Amazon River. All too soon it was time to return to Nauta, with a last side trip to the Amazon Rescue Centre (CREA) where biologists and volunteers take care of the endangered species of manatees that the authorities have rescued. There they are rehabilitated and prepared for reintroduction to their natural habitat. The rescue centre also houses other animals that have been impounded from captors for the trade in exotic species.